Are you working from home and not quite in a position to commit to renting a dedicated serviced office? One of our fantastic virtual office packages could be just the solution you need! 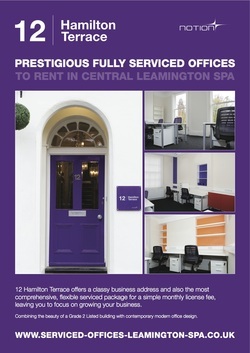 A virtual office at 12 Hamilton Terrace will allow you use of our outstanding, prestigious, Leamington Spa town-centre address as your business address, for a fraction of the price of a dedicated office. We will forward your mail, so you'll no longer have to give your clients or suppliers your home address; as well as set up a new phone number for you, which will be diverted to any UK land-line or mobile number of your choice. We can also provide you with a personalised 24/7 telephone answering service as well as up to 10 hours use of our meeting room each month!